When I heard there was a book series out there where everyone got plastic surgery to turn them pretty on their 16th birthday, I knew it would be right up my alley. It's high concept, it's dystopian, it involves a female protagonist - and I came to it so late that I could buy the whole series and not have to wait between books. 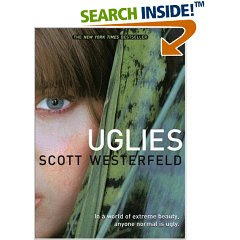 Uglies, by Scott Westerfeld, introduces us to a world where civilization has inched its way back into a robust existence after being nearly destroyed by us careless "Rusties" of the 21st century. Hundreds of years later, there is no more war because everyone over 16 is pretty and lives a vapid life of partying and feeling "bubbly". Tally Youngblood, nearly 16, can't wait to join the pretty life and rejoin her best friend Peris who had his pretty transformation already. But for now, she's still ugly and still up to playing “ugly” tricks - tricks that grow more dangerous after she meets Shay, also close to her 16th birthday but unsure she really wants to go through with the operation. Shay insists she's made contact with people off the grid, "Smokies", who say that being pretty is not all it's cut out to be. When Shay runs away, Tally is recruited for a mission by the ruling class "Specials" to get Shay back or she’ll be denied the chance to turn and will be ugly forever. The plot is very well paced, following Tally from the city out into the wilderness on her search for Shay and the “Smokies”. Westerfeld grinds his exposition so finely that I never felt bored by a bunch of “telly” scenes. And even though Tally has a lot of her decisions made for her and character growth is pretty much accidental, it feels authentic to the story. The social commentary is very sharp as well, especially in regards to the superficial life of the post-op “pretties”. In one passage, Tally is told about a beautiful, rare orchid that was genetically reengineered and is now a monoculture, choking out any biodiversity it comes in contact with. Doesn’t that sound just so “pretty”? 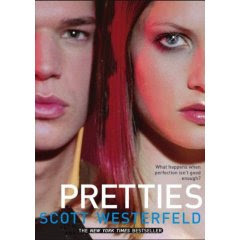 The second book, "Pretties" continues where "Uglies" left off. If you haven't read book one and don't want to be spoiled, STOP READING NOW. Ok, so now Tally has had her surgery and her "smoky" friends are trying to contact her and save her from her "pretty" ways. She now runs with a group of "pretties" who seem to be smarter than the rest, called "crims" because of their "criminal" backgrounds as "uglies". The leader of this group is Zane and he and Tally start up a romance while still pulling "ugly" tricks. This book suffered a bit from "middle" book syndrome but was still very compelling save for some blatant anorexia and cutting. Tally and Shay continue their "love/hate" friendship/rivalry which is a well-drawn and convincing adolescent relationship. You learn more about the world the author has created and are well set up for the third book, "Specials". 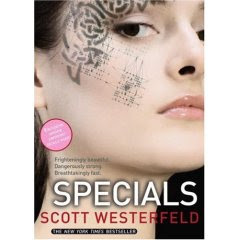 The third book, "Specials" follows Tally in her new role as a "Special". Shay is now her boss and she feels contempt for anyone not "Special", including her boyfriend Zane. Shay, Tally and their group of "cutters" are charged with finding the new "smoky" settlement and stemming the tide of cured "pretty" runaways from the city. Again, Tally must overcome societal norms and be true to herself. Because she has a weaponized body, the story is full of action which reads quickly but was not as interesting to me personally. Still, the story comes to a satisfying conclusion and you feel like you're leaving a friend when you read the last page. And now of course I am totally kicking myself because Scott Westerfeld was at Bologna Children's book fair and I could have met him but didn't. Do'h! you've been a busy lady with your reading. You write thought-provoking reviews! You read more in a month than I do in a year! But this sounds like a cool series (thanks for the spoiler alert!). I love anything dystopian! I'm almost done with Specials. I love your "middle book syndrome" classification for Pretties! First, thanks for commenting on my blog! I haven't read any of these books, but I've heard so much about Uglies that I just might have to give them a try! 4th chapter and it is okay i suggest you give it a try i haven't even seen the movie but my friend saw it and said that it doesn't follow the book at all so if you are going to read the book don't watch the movie first well i should probably tell you that i am Scott Westerfeld so i am really glad that you like my books thanks for the comments and i hope that you tell people about my series!!!! !